With our second release of 2011, Earth Mantra has a very special treat for our listeners - and one with a particular significance for everyone who loves electronic music. 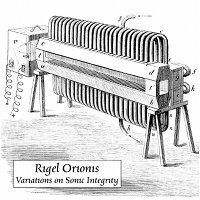 It is our very great privilege to be able to bring our listeners a new album by none other than Jim Brenholts, aka Rigel Orionis, entitled Variations on Sonic Integrity. For those who didn't know Jim, allow us to share a little of his story. He never would have let anyone get away with calling him one, but Jim clearly was nothing less than a luminary of the ambient world. Well known and regarded for his incisive reviews and commentary, Jim also developed quite a talent at ambient composition, releasing a variety of albums over the years, both solo and in collaboration. Unfortunately, Jim passed away in 2009, leaving us only with memories and his indelible imprint upon this art form we call electronic music. Fortunately for us, however, he also had completed quite a number of unreleased works, including the mysterious and inspiring album that we proudly present to you today. And what a release it is. This two-disc bonanza of textural abstract ambient goodness contains twelve variations on a theme, all reinterpretations of a base motif that Jim composed, recomposed, deconstructed, and reconstructed into a variety of drones and sonic journeys. As always with Jim's work, the music demands as much of the listener as it did of its composer, challenging people to not just passively enjoy the music but to actively participate in the experience, to sit up and pay attention lest something important sneak by unobserved. This is not ear candy, folks; this is mind music. Maybe the best word to use when describing this release is "intense". All of Jim's music seethes with an enigmatic energy, containing an invisible reservoir of power around which the air seems to crackle and shimmer. And Variations on Sonic Integrity certainly has an almost fundamental magnetism to it, as if somehow Jim bottled up the forces of nature into twelve recordings and captured them in stasis for the rest of us to hear. A remarkable piece of sound sculpture, by a remarkable man. So it is with great pleasure that we unveil Variations on Sonic Integrity. Dark ambient music that we feel is certain to send a chill down your spine and put a smile on your face. We at Earth Mantra miss Jim, and feel very honored to be able to bring his music to our audience. dark and mysterious messages from beyond, a beautiful work from an amazing human being, RIP Jim. Dark and magical-- full of intrigue and mystery. These pieces keep throwing you loops until you are so lost you are found again. RIP Jim. Wow! What a treat from the ambient master! This is a wonderful release! Dark, Rich, Mysterious, and Powerful!